Author Thomas Bell is pleased to announce the release of his debut memoir, My Dad Is a Freak. This is a memoir detailing one man’s serendipitous journey from bachelorhood to parenthood. After his latest girlfriend becomes his wife, and his wife becomes pregnant, Tom Bell finds himself a first time father at nearly 50 years old. Over the years, he has shown only a passing interest in his nieces and nephews, and has never touched someone else’s poo. Now, with an eight month-old baby and two toddlers, he wracks his brain for any useful cross-over skills accumulated from a half-century of single life. My Dad Is a Freak is the conclusion that each of his children will inevitably arrive at, in their own good time, despite his best efforts. 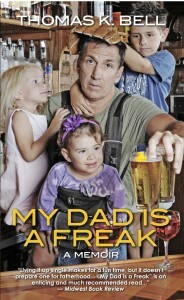 My Dad Is a Freak was published May 20, 2012 by A.f.F. & Sons. It is available in print and as an eBook through Amazon.com, Amazon UK, Barnes & Noble and Smashwords.